One of the most daunting tasks planning this trip was figuring out where to stay at each stop. With Napa being our longest stop of the trip, I wanted to make sure our accommodations were central to where we would be doing tastings, have free parking & give us some of the amenities we'd be craving on the tail end of our trip. It didn't take long for me to find White House Inn at Napa or as I like to refer to it, a blogger's dream! I was so excited the entire trip to check in & the few days we spent at the hotel made our trip that much more enjoyable! We pulled up to the White House Inn & I immediately fell in love with the charm of this boutique hotel. A little bit bed & breakfast with the feel of a high end luxurious hotel. Upon checking in, each guest is given an iPad to use at their leisure. The staff has filled the iPad with restaurant & winery recommendations along with activities to do around the Napa & Sonoma area. All the rooms are different, but have the one commonality - they all feel luxurious.If you watched any part of my InstaStories while we were in Napa, then you saw the way the hotel was decorated. It recently underwent a complete renovation & there was not one detail that was left out. From a separate makeup wash cloth to Apple TV's in every room so that you could log into your Netflix account if you wanted to - we were in heaven! There were points during each day that Gary & I would look at each other and say - should we just head back to the hotel and relax by the pool? Unfortunately for us, there just wasn't enough time to enjoy the spa services that they offered, but we will most definitely be back to try them out!! One of my favorite treats while we were at the hotel was the included breakfast. While Gary was busy wondering if these mini creations would fill him up, which they did, I was left feeling completely satiated by a delicious and healthy breakfast. Trust me, our trip was full of great meals, but most of them weren't the healthiest - knowing that I was starting my day out with freshly made smoothies. delicious fruit salad and egg creations was amazing. Oh, it was also different every morning so it truly was like a restaurant experience. it felt like your house, just better! Was there anything that I would change about our stay? The answer, only if we were able to stay longer!! If you've followed this blog through any of our trips, then you might know I've actually never dedicated an entire post to a hotel before & this isn't sponsored in any way! 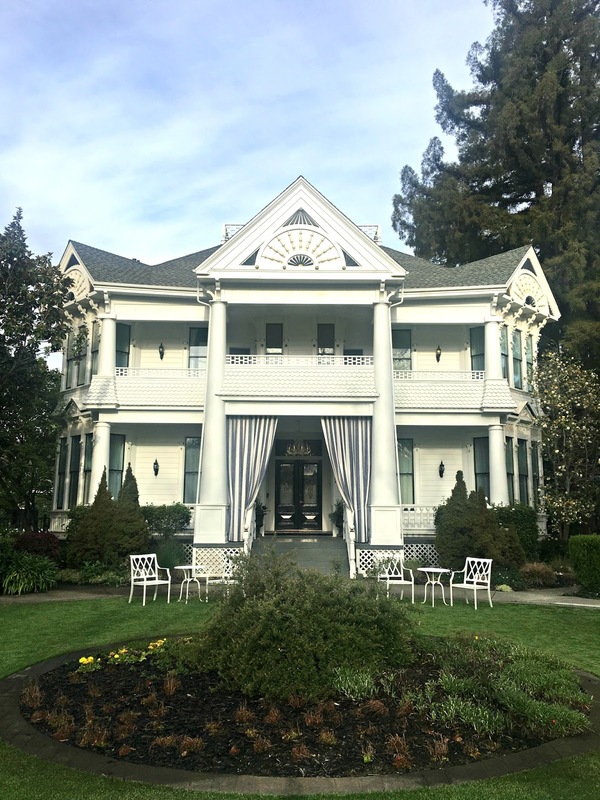 We both enjoyed our stay at White House Inn at Napa so much that I wanted to share what made part of our Napa adventure that much more enjoyable! What types of things do you look for when booking hotel accommodations? That place is stunning! It sounds like heaven!! Just gorgeous!!! Sounds like an amazing stay! Oh my goodness, I did not realize you went to Napa as well!! How amazing and wow, did you pick a great place to stay! What a sweet lil breakfast buffet too! Oh wow! What a wonderful stay. LovE those breakfasts and that pool!! I also love that they gave a dark towel for makeup. Such cool details! Total bloggers dream house ;) It looks so nice, and that pool!! What a great place to stay. Oh my goodness- what a beautiful place! So happy you enjoyed your trip! That's great to hear you enjoyed your stay! The property looks gorgeous and so awesome about the breakfast -- it looks delicious! Love that they give winery and restaurant recommendations on an iPad -- so innovative! I have never been to Napa but it's super high on our list! Definitely such a little charming Inn! And the breakfast all looks SO yummy! What a charming little spot! I love staying at bed and breakfasts and feel like the service is always so much better! This property looks seriously beautiful! I really love the pool area! How cute is this place?! Love! I always love stopping by your blog to see where you've been to visit. That hotel sounds amazing and your outfits are perfection !!! ok that place is a dream! i think you nailed it - it's like a boutique hotel mixed with a b&b. that breakfast spread omg. and the grounds. i really cant get over all the detail there - which is key! glad it was a lovely stay! I love bed & breakfasts for this reason, you get a more intimate feel in terms of treatment and decor and you can also get that high end hotel experience. That said, this place looks so charming and it seems they really did take into consideration the use of social media, which I find that more and more restaurants and hotels are starting to do, it helps with their marketing I'd assume. I mean, who wouldn't want to take photos of their daily faves on that marble table?! Lol! The food looks absolutely delish and I love that it's healthy and switched up everyday. You also look absolutely gorgeous in that one shoulder top, girlie! Thanks for sharing your experience with us and I hope you're having a week so far! This place is stunning! I am definitely adding this stop to my must stay list. What a gorgeous place to rest and relax at, and the personal ipads are a thoughtful touch. this is so cute!! those lark cookies are SO good. This sounds like an awesome place to stay when visiting Napa! An iPad for every guest? Apple TVs to be able to watch Netflix? Um... yes, I absolutely need to go here sometime soon! It looks so perfect! Love the makeup washcloth-- how genius is that?!? This place looks so charming! All the accommodations seem so luxurious. Plus, a separate makeup washcloth? Genius, lol. It's the little things, right? This looks like the cutest place ever! I love how peaceful the garden area by the pool looks. I tend to like places that have a little more charm, while my husband prefers modern, so this looks like a good mix with how updated the interior looks! How pretty!!! I love that they give you an iPad with local ideas upon check in and that pool area looks darling! Wow!! This place is amazing and you are giving me serious wanderlust. Oh how quaint! It looks like a lovely place! What a beautiful place to stay! Gorgeous. I've never seen anything look so homey & comfy & beautiful! Impressive! This is everything I would want and more from a hotel! So adorable and I love a central location, nothing better than being able to walk places! I love that it looks like a gorgeous house and not like the average hotel. That breakfast looks so yummy!! This place looks and sounds HEAVENLY! I cannot wait to go to Napa one day. I will definitely keep this place in mind when we do go! I can see why you loved this hotel so much- it is beautiful and so unique!! What a dreamy location to stay & enjoy the last part of your trip! This hotel sounds absolutely amazing, such a great find! This sounds amazing and oh so comfy! It is the cutest place! Love that they have Apple TV's -- I would want an entire weekend stay there! I gasped at the very first photo of the hotel haha-- I LOVE IT! It is officially where I'm going to stay whenever I make it to Napa lol ;) That photo of you is gorgeous, too! Okay you found the perfect place to stay! I am with Erin above. That first photo gets major heart eyes! Looks absolutely amazing! I love the uniqueness of inns/B&Bs. Wow, that sounds like a great hotel! I will definitely keep it in mind for our next trip to Napa! What a wonderful place to stay. Your trip keeps sounding better and better. I need to plan a trip back to Napa. Oh my gosh, this place looks amazing! It looks like such a tranquil place to visit! What a gorgeous gem of a hotel in Napa! It sounds like they do everything to make their guests feel comfortable and accommodated from the iPad to the included breakfast. Definitely keeping this hotel on my radar for whenever my dream Napa trip eventually happens. Omg this hotel looks so gorgeous! I love how quaint it looks! I want to go to Napa so bad! Everything looks so pretty and perfect to spend an enjoyable stay! What a way to travel in style! The place looks lovely and I have to say from observations, it's becoming more common to see ipads around at luxury accommodation. It's a nice touch as you can easily find directions, see what the main tourist attractions are or quickly look something up. Amazing post! The food looks so yummy and you dear looks so happy to be there! I'll take a little boutique Inn over a big hotel any day. Loved this review, if I ever find myself in Napa, I will have to stay here! This place looks beautiful! Love all the photos! It truly looks like a wonderful haven after a busy day out and about. Oh my goodness! How beautiful! All of the lounge areas around the pool are incredible. Question for you (if you have time to answer!) - Would you recommend staying at the hotel with a group of people? We have a group of five couples heading to Napa next year and none of us have been before. We are trying to find the perfect place to stay! Thanks love! What a beautiful place. The outside is gorgeous. And the breakfast looked really good! We tend to stay at chain hotels when we're traveling because we have points and it's just easier that way, but you have me convinced to try out White House Inn next time we're in Napa! It looks so beautiful, and they really do take such good care of you! I'm so obsessed with this hotel!! Great find, B!! I love the drapes on the front porch (I've seen this done in Texas to keep the heat out - crazy, right?!)... I love the hallway carpet... and the rooms seem SO serene! The perfect place for an anniversary for sure. My mom and sister are headed to Napa for a girls trip with my aunt and cousin, so I'll have to send this to them... along with your travel guide!